Despite the auto industry's deep recession, Tom Wolfe of Wachovia Dealer Services is overseeing a growing operation. 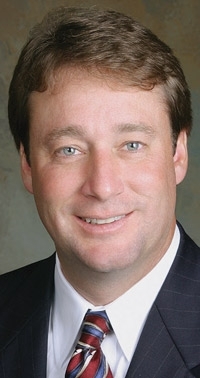 After Wells Fargo completed its acquisition of Wachovia, the company named Wolfe president of its combined automotive loan business. Wachovia Dealer Services runs the combined companies' indirect lending business, which makes retail loans to consumers through referrals from dealerships. It also oversees commercial lending for car dealerships. The merger places Wachovia neck and neck with Chase Auto Finance, which has long been the largest noncaptive auto lender. Wolfe spoke with Staff Reporter Donna Harris about the merger's impact on dealer services. Why did Wells use Wachovia Dealer Services for dealers? Wells favored a decentralized model. Wells shut down its indirect lending business in December, and all new business comes into my group. We had Wells' dealers reapply for credit with us and sign new dealer agreements. What did each organization bring to the merger? Wachovia Dealer Services has 46 regional business centers and is in 47 states. We are still the number-one used-car lender in the nation. That's our niche. Wells Fargo has a strong branch bank network, with 6,500 branches. That allows us to support our dealers' deposit and treasury needs. For Wells Fargo, commercial and retail lending were different parts of the organization. Wachovia channels retail and wholesale through the same business unit. There's very little overlap in the wholesale business. Most of Wachovia's wholesale business was on the East Coast, and most of Wells Fargo's wholesale business was on the West Coast. What impact has the merger had on retail and wholesale lending volume? We originated more in indirect auto loans in the first quarter of 2009 than in either the fourth or third quarters of 2008 -- a positive sign. We have slightly over 9,000 dealers. The combined banks have commercial business of $6.7 billion in outstanding balances. Wachovia had $4 billion in commercial [floorplan] loans before the merger. Wachovia's retail indirect business [new and used-vehicle auto loans] has $26.7 billion in outstanding balances. Last year, when we didn't know if we would merge with Citi Financial or Wells Fargo, our volumes declined somewhat. But now there is renewed confidence. We have funding and we are buying contracts like we were last summer. Will the organization keep the "Wachovia" name? For how long? We're using the Wachovia name on the indirect retail lending side. On the commercial side, we're known as Wachovia or Wells, depending on existing geography. But the "Wachovia Dealer Services" name will go away. Ultimately, the operation will be branded "Wells." It will take a couple of years to change the branding. Chrysler Financial and GMAC Financial Services, especially, lost dealer business last year when they dropped leasing and tightened credit standards. Are you picking up business? We obviously support a lot of dealers. For captives, the rules have changed. This creates a great opportunity. Will you get back into leasing? Wells has some leases on the books. But we've been out of leasing for a long time -- 10-plus years. With car values changing the way they are, it is hard to back the value of a car a few years from now. Many of the captives have had special discounts and bonuses for dealers who give them their wholesale and much of their retail business. Do you? We price products and services for the value they provide and do not get into discounting. We try to stay consistent in how we price. I don't like to formalize discounts. Many lenders are dropping dealer floorplan accounts. You have said you are adding dealers selectively. We look at the profitability of the entire book of business. We want to know that we have a long-term relationship. It is harder to commit capital to one type of transaction. As tight as capital is, you want to look for someone who wants a relationship with you. We are not trying to be a transaction lender. We have been in this space for a long time. Not in and out. That speaks to our commitment to the business. How does the retail lending side of the business look? Is it deteriorating? The last 60 to 90 days the traffic has been a higher credit quality. The subprime customer is not in a position to buy a car. Media reports on the lack of available credit have scared these people away. People don't want to be embarrassed. Right now the average credit score for borrowers is 700-plus, where it was 680 for us a year ago. We operate with five credit tiers, and they remain consistent. We still lend to nonprime customers. We are not willing to advance as much on a vehicle. Customers who are upside down in their vehicles have to drive it quite a while longer. Dealer profitability, manufacturer profitability and consumer jobs.